Used for everything from geographic evaluation to secret spy missions, aerial photography has a rich and varied history that involves the intimate and reciprocal evolution of two key modern technologies: photography and flight. 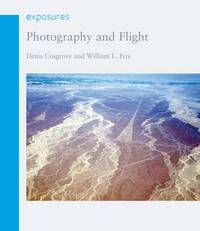 In "Photography and Flight", Denis Cosgrove and William Fox begin with early images taken from hot-air balloons and fixed platforms, then turn to the impact of hand-held camera technology and powered flight in the early twentieth century, explaining how military reconnaissance and governmental projects were instrumental in catalyzing these and other innovations in the field.They examine pivotal historical moments in which aerial photography began to establish itself as essential tool, such as in World War II military strategies, high-altitude photography taken from postwar rockets and aircraft, and the extensive implementation of aerial photography during the Cold War and the Cuban Missile Crisis. The book also explores the advancement of geographic scholarship through aerial photography, ranging from military excursions into remote areas such as Antarctica, to the images of the curvature of the earth taken during the Apollo space missions.While digital technology and remote sensing have changed the landscape of photography, "Photography and Flight" argues that they have not diminished the significance of aerial photography in providing images of the earth.Rather, new technologies and resulting innovations such as Google Earth have enabled the mass democratization of access to such information. "Photography and Flight" ultimately shows how, from far above us, the aerial camera continues to unearth telling details about the land and those who live upon it. Denis Cosgrove is Professor in the Department of Geography at the University of California, Los Angeles. He is author or editor of many books including Mappings (Reaktion Books, 1999), Apollo's Eye: A Cartographic Genealogy of the Earth in the Western Imagination (2001), Imagining Eden: Connecting Landscapes (with Lyle Gomes and Karen Sinsheimer, 2005), and High Places: Cultural Geographies of Mountains and Ice (with Veronica della Dora, 2008).William L. Fox is a writer, independent scholar, and poet based in California. He is the author of many books and articles including Approaching Nowhere (with Jeff Brouws, 2006), Observations in an Occupied Wilderness (with Terry Falke, 2006) and Oblivion (with David Maisel, 2006).